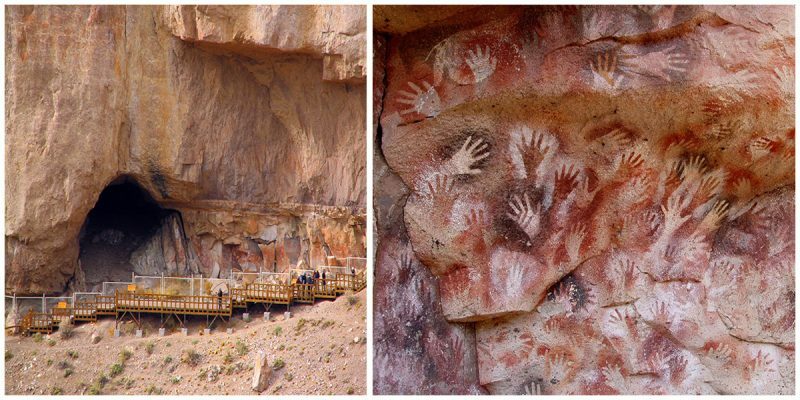 Located in Río Pinturas in the province of Santa Cruz, Argentina, this cave contains an exceptional assembly of cave art, made somewhere between 13,000 and 9,500 years ago. 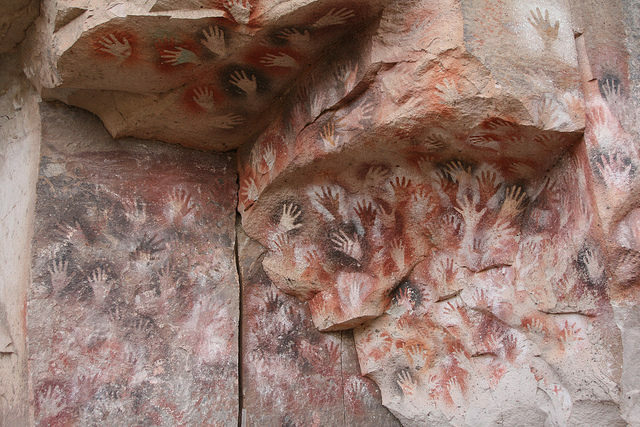 The cave is known as the “Cueva de las Manos” which literally means, “the Cave of Hands”. 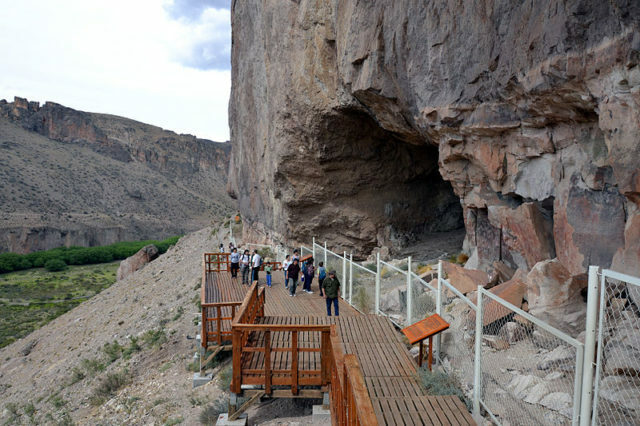 The region where the cave is located has been an area of major focus for archaeological research for more than 25 years. 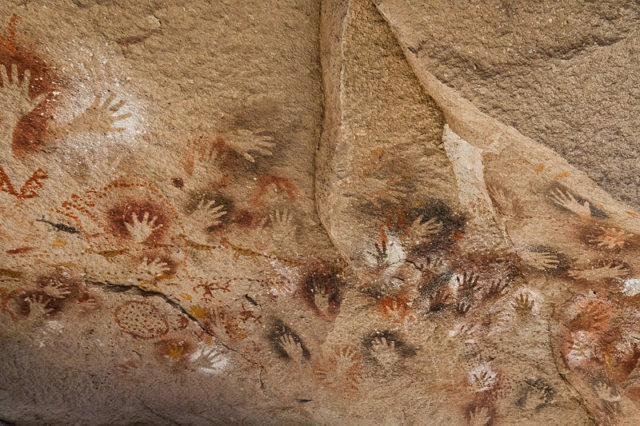 Archaeologists speculate that the small handprints etched on the cave walls belonged to the predecessors of the Tehuelche tribe, a group of indigenous peoples of Patagonia with a history of over 14,500 years. 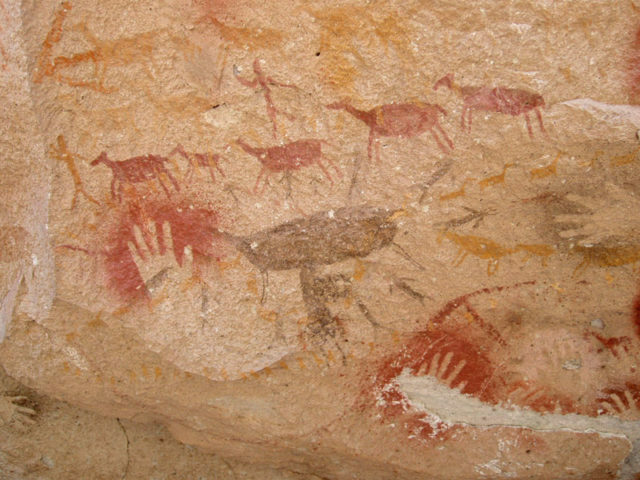 The hunting scenes are naturalistic portrayals of a variety of hunting techniques, including the use of “bolas“ – а throwing weapon made of rounded stones at the end of interconnected crude leather straps, which was designed to capture animals by entangling their legs. 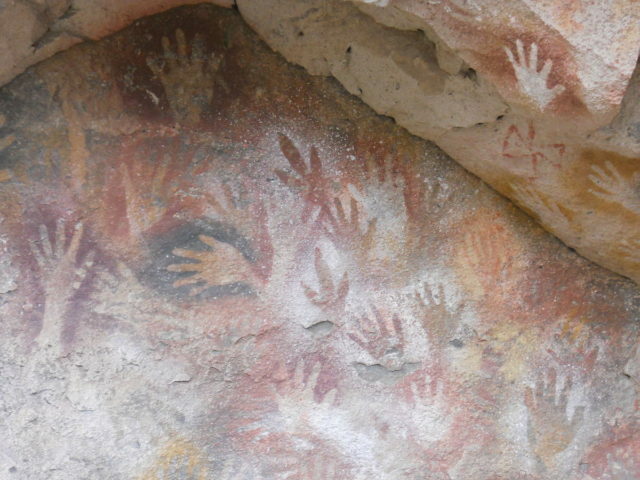 The hand imprints were made using different techniques. 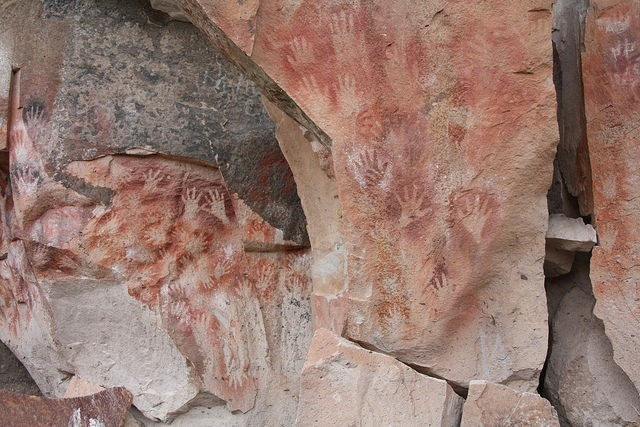 The most ancient and famous are overlapped negative images, made by placing the hand on the rock face and creating an outline by blowing pigments through a tube. 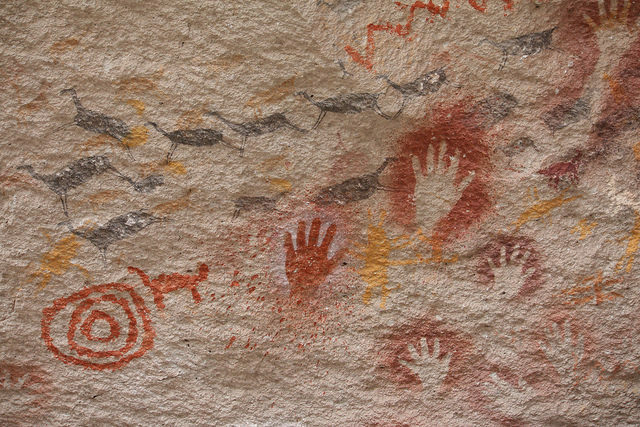 In addition to the hand stenciled-outlines, there are also highly accurate representations of animals and human silhouettes, and geometric signs such as circles, stars, curved and spiral layouts. 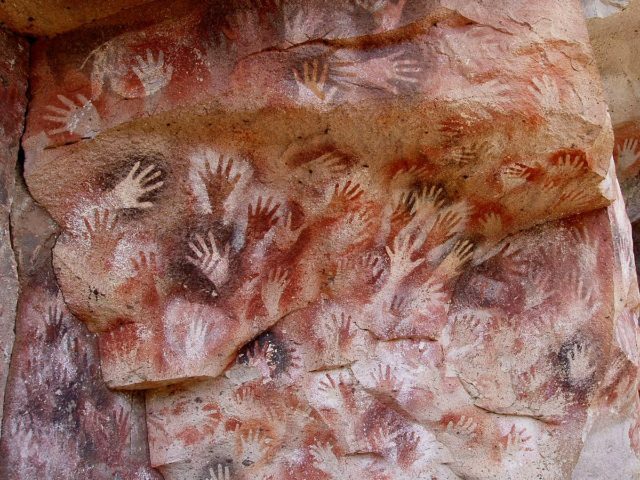 The paints were made from vegetation (roots, bark, etc.) 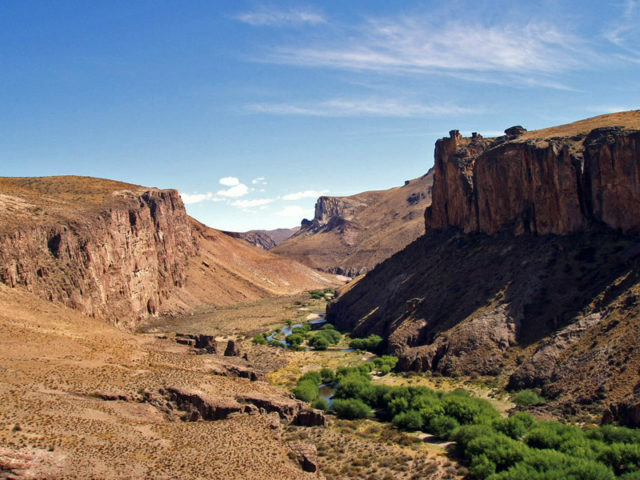 and the hues managed were black, purplish red, yellow, white, purple and very rarely green. 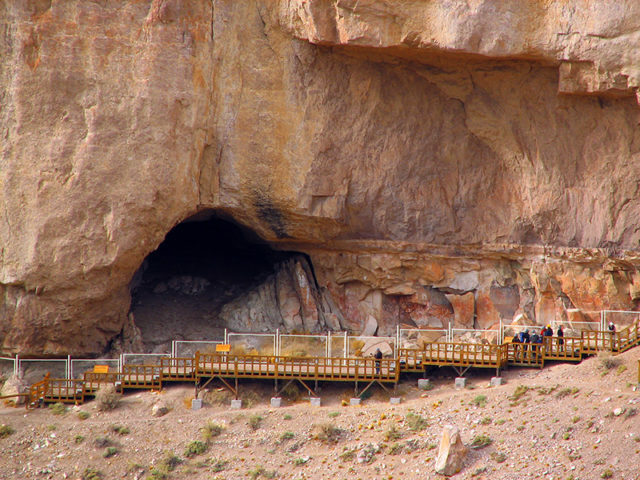 The cave is not very big in size, so probably people came here to relax after hunting and conducted various rituals. 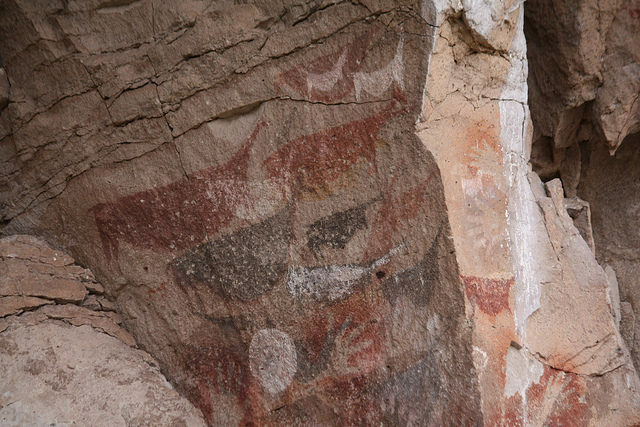 The site has been declared a National Historic Monument and World Heritage Site (UNESCO) in 1999, not only for its artistic magnificence but as one of the main testimonies of prehistoric hunters that occupied the area.